Fly-75V Flyaway antenna delivers improved high capacity satellite broadband for FRS. 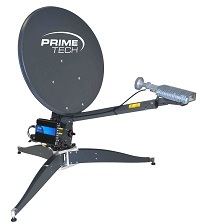 Primetech has announced that it is now releasing and supporting the C-COM iNetVu Fly-75V Flyaway antenna in the UK market. The system delivers high capacity Ka band satellite capability in a highly portable, self-pointing auto-acquire unit that can be assembled in 10 minutes, delivering fast satellite acquisition, anytime, anywhere.